Past President, Bill Pratt was recognized by both his original club (Rotary Club of Brunswick) and his current club (Rotary Club of Geelong East) for a combined 50 years of service to Rotary. Bill enjoyed 13 years with The Rotary Club of Brunswick before moving to Geelong and joining The Rotary Club of Geelong East. He is most proud of the organisations leading role in the eradication of Polio and has been a great contributor to the fundraising done for this cause. Bill also works regularly at Donations In Kind, where he sorts goods suitable for re-use in 3rd world countries and packs them into containers for shipping. 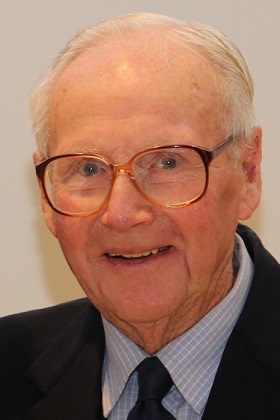 In 1987 / 89, Bill served as club President. Bill has served the local as well as the international community in a variety of ways. He was a leader in establishing a Sheltered Workshop in Brunswick, a project he is rightly proud of. Bill was recognized in a series of speeches and presentations. The longest serving member of The Rotary Club of Geelong East, Past President David Berretta spoke of Bill’s impact on the club and the projects he has been active in. David presented Bill with a plaque to commemorate his 50 Years’ Service on behalf of both Rotary clubs. President of Brunswick Tullarmarine Rotary Club (formerly Brunswick), President Kevin Dale spoke of Bill’s work with that club and invited longtime friend of Bill’s, Greg Sewell to elaborate on the Sheltered Workshop project. Kevin presented Bill with a letter of congratulations from the Rotary International President, John Germ and mementos from The Rotary Club of Brunswick. The final presentation was both a personal one from the President of The Rotary Club of Geelong East, Bill’s daughter, Janine Koch. Janine spoke about Bill, the father and family man and his healthy outlook on life. At the end of her presentation, Janine presented Bill with a ruby Paul Harris Fellow recognition.